Hawai‘i’s streams are home to a unique variety of native fish, shrimp, mollusks and insects, most found nowhere else in the world. Their origin and link to the ocean is evident in their mainly diadromous life cycle, which means “two runs”, one to the ocean as newly hatched larvae and subsequent return from the ocean to freshwater as juveniles. This completes their life cycle and stresses the importance of maintaining the “mauka (mountain) to makai (ocean)” connection. There are five species of native stream fish (four gobies and an eleotrid). Four of these are endemic (found nowhere else on earth) and one is indigenous (native to Hawai‘i and other locations). Their distribution along the stream is believed to be influenced by their climbing ability. 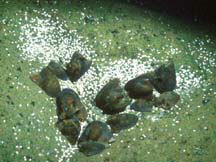 Native stream shellfish, all of which are endemic, consists of two crustaceans, and three mollusks. Hawai‘i’s streams are also home to the larval forms (nymphs) of dragonflies and damselflies. Both have members that are endemic to Hawai‘i. Appearance: Juveniles and females are a mottled olive to brown color. The males have black heads and orange tails, as in the photo. Size: Length up to 5 inches. Habitat: Usually found in the upper stream reaches. Diet: Feeds on plant and animal matter. Interesting Facts: This fish has several Hawaiian names which is dependent upon the island the person comes from. The name ‘alamo‘o is used on the Big Island, originating in the Hilo area, and mo‘o means “lizard-like” referring to the appearance of the head. The name hi‘u kole is used elsewhere and means “red tail” referring to the male fish with the orange tail. Appearance: Highly variable; juveniles and females are usually mottled brown or gray; males are slate gray-blue with striped or variegated markings, or black with white stripes and have a pronounced dorsal fin (male in photo). Size: Length up to 7 inches. Habitat: Usually found in the middle stream reaches, preferring fast-flowing water. Diet: Feeds on algae growing on rocks. Interesting Facts: Nōpili received its name because of its ability to cling (pili) fast to wet stones. The early Hawaiians favored this goby as food and as a symbol of good luck. Appearance: Mottled brown and black with a white underside. Vertical dark and light bands are visible on the dorsal and caudal fins, and there is a dark patch on the caudal peduncle. Size: Length up to about 14 inches. Habitat: Usually found in the lower to middle stream reaches. Diet: Omnivorous feeding mostly on filamentous green algae, crustaceans, worms, snails, and aquatic insects. Distribution: Indigenous; also found in other Pacific Islands. Interesting Facts: The name nakea means “whitish”, probably referring to the ‘o‘opu’s white underside. Hawaiians favored this goby as a food fish probably because of its large size. Appearance: Easily identified by a black band that extends diagonally through the eye. The body is yellow-brown in color and may be marked with 9 to 11 vertical black bands on its sides. Size: Length up to about 5 inches. Habitat: Found in the estuaries and lower stream reaches, preferring soft bottoms. Diet: Omnivorous feeding on plant and animal matter. Interesting Facts: The name naniha means “avoidance” in Hawaiian, but the significance of this is not known. 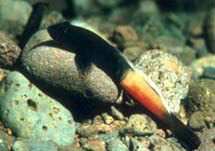 Appearance: Dark brown or black in coloration with separate pelvic fins. Size: Length up to about 13 inches. Habitat: Estuaries and lower stream reaches. Diet: Feeds on invertebrates and small fishes. Interesting Facts: Unable to climb above waterfalls and fast flowing stream sections. Appearance: Golden-brown, dark green to black in coloration. Size: It reaches a length of 2 inches. Habitat: Usually found in the upper stream reaches in fast flowing water. Diet: Feeds on microscopic plant and animal matter. Interesting Facts: Exhibits the greatest climbing ability as they are observed above waterfalls over 100 feet in height. Frequently found arranged side by side in bands in deep pools. Appearance: This prawn is light to dark brown in color with striped pincers. One pincher is noticeably larger than the other. Size: Average body length of 4 inches. Habitat: Estuary and lower stream reaches. Diet: Feeds on both plant and animal matter. Interesting Facts: The name oeha’a means to “walk crookedly” which is a result of the uneven pincher sizes. Appearance: This freshwater snail has a black shell with knobby bumps on its surface. The underside of the shell is orange. Shell shape and texture is variable, depending on the snail’s habitat. Size: Shell diameter up to 2 inches. Habitat: Usually found in the lower and middle stream reaches. Diet: Feeds on algae growing on the rocks. Interesting Facts: Hīhīwai were also called wī, meaning “famine”, so hīhīwai were eaten during times when food was scarce. Appearance: Smooth thin shell that is pale brown in color and flattened in profile with wing-like projections at the apex. Size: Shell diameter up to 1 inch. Interesting Facts: The name hapawai means “half-freshwater” and refers to its brackish water habitat. Note numerous white egg capsules in the photograph. Appearance: The shell is high, smooth, and dark-colored like its marine cousin, the pipipi. Habitat: Brackish water species found in estuarine areas and pools near the seashore. Interesting Facts: The pipiwai was also used as a food source by early Hawaiians. Text: Glenn Higashi, Division of Aquatic Resources.